Decorating with wire shelving is something that is usually restricted to kitchens and bathrooms as wire shelves are practical, hard-wearing and you can see which items you want very quickly. However metal shelves are also hugely contemporary and versatile, meaning that they have a lot to offer other rooms in the home too. Ideal for kitchens and pantry areas, wire shelving can be fitted in anywhere. They are especially good for making more room in a small kitchen as they are reflective and open, creating the illusion of more space as well as containing lots of storage. As well as walls, think about installing them hanging from the ceiling, over doorways, or underneath wall mounted cabinets. Ceiling mounted units are also ideal places for hanging pans and utensils from. Or do a Nigella with fairy lights, and weave a string in and out of the metal shelves. A living room is a hard place to incorporate wire shelving, but if you have a contemporary living room then you can try using a tall wire shelving unit to display books, ornaments and vases on to create a focal point within the room. The addition of wire doors would add a modern, industrialist look. A bedroom can truly be a room in which wire units can shine as they are ideal for closet space, but needn't be hidden away. If you use the addition of hat boxes and fabric boxes, keep things neat, and make sure everything has a place, it can make a very decorative addition. Try adding fabric swags to the top of the unit to soften the look if you wish, or even a small roller blind to the front to hide any clutter. Metal shelves are also very desirable additions to teenagers or older children's bedrooms, but are best kept out of smaller children's rooms as small fingers can become easily trapped. A traditional place for wire and metal shelves is the bathroom. Ideally keep items on the units as neat and ordered as possible; adding decorative glass bottles, or folded towels in a complementary color to your decor is the best way to use them. Try to wipe them down at least weekly, as the buildup of moisture can cause rust - stainless steel rather than chrome works best for avoiding this scenario. It is very tempting when installing wire shelves to just put one unit under another without making correct provision for their use. As a guide it is ideal to have at least 12in/30cm from the bottom of one shelf to the top of another, if you are using it for books, so alter this according to what you are using it for. It is preferable to have another person stand against a wall and hold the shelf or unit against the wall so you can judge where it looks best - make a pencil mark so you don't forget! 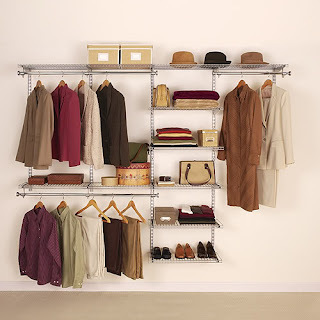 Allow plenty of room if you are installing a unit in the corner, and wherever you install your shelves try to visualize them as solid and think if you would still put them that close together. 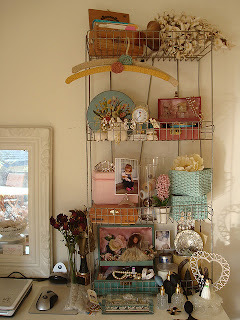 When decorating with wire shelving, it is untrue to say that metal can match with anything. Although it is versatile, and would not clash with any particular color, that are certainly some colors that work better than others with metallics; much like when choosing kitchen colors that match with stainless steel appliances some thought must go into your paint or paper choice. colors like ice blue or white are more difficult to use without feeling industrial, but may suit a bathroom or home office. Using grey and black would usually be a complete no-no, but in small spaces could be effective, especially if you just paint the area behind the wire shelves you are decorating with. Decorating with wire shelving is a versatile process, especially if you are open to new ideas of decorating, and don't just restrict their use to the bathroom.